Without these permissions any database is useless and that is why it is not possible to have your tracks, points, downloading directory of online maps, online maps cache and lots of other DTB-related files on the external SD card root directory. All maps you are downloading by Locus from online sources or from Locus Store are stored by default in /Locus/Maps/ directory in the inner storage of your device. This, unfortunately, can not be changed. Nevertheless, all downloaded maps can be transferred to your external SD card (with any mobile file manager, e.g. ES Explorer) and linked to Locus via the Add external map command. The same procedure can be applied to all other raster maps obtained from other sources out of Locus. This method works on Android 5.0 and higher only. 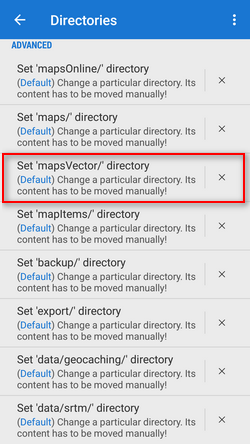 If you use Android 4.4.x, follow the same instructions as for raster maps! Do not name your new folder on external SD card “Locus” - the operation system would be confused which directory is Locus default root which may result in Locus malfunction. 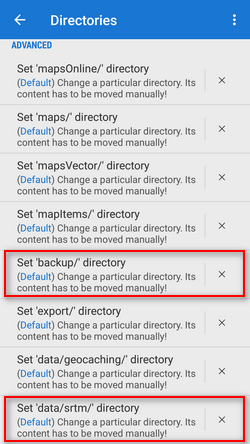 All content of this folder, including your purchased maps, recorded tracks or downloaded geocaches will be automatically deleted when you uninstall Locus. 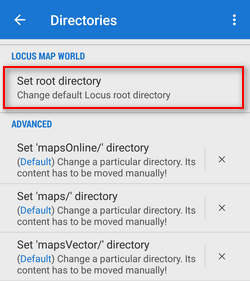 If you upgrade from Locus Map Free to Locus Map Pro, you can not use the same data (maps/tracks/points) as the two apps create their own individual directory structures. 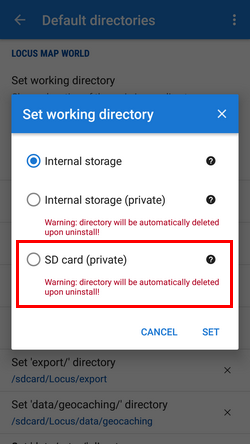 A few tips from Locus users how to tackle full access to external SD card on rooted devices. None of these methods are fully tested and may not work on all devices or, in case of inexperienced manipulation, can cause damage to your data or mobile device. Restart Locus. It can write on your external SD card as it could in Android 4.3. Another option for rooted devices is to format your SD card in FAT32 system in your PC. That eliminates the file system rights. If you use a SD card larger than 64 GB you need a tool like H2format for Windows to format the SD card with FAT32. Be aware that this does not support files larger than 4 GB. Open “TWRP” app and go to the menu “Install” and select the “ExtSD_Fix_rw-signed-v1.9b.zip” Zip-File. Install only with “TWRP” App over the Menu “Install“. You must open the menu „Install TWRP“ und select your device and the „Recovery Version to install“ and download it. Then download and install „twrp-3.0.2-2.klte.img“. Boot the Android Device with the TWRP Recovery-Mod. Now you have Write Access for all apps on your extSD Card image. If you cannot install Xposed because it is not supported by your Android version there is another way to make your external SD read-write (root is required too!). After adding, FM offers to move the files for you. Click yes. Wait until the moving operation is done, then click on the PIN. If PIN turns green, you are all set. The files will exist in both the source and destination after moving. This is expected and is normal. The files you see in your internal sdcard actually reside in your external sdcard now and if you “unpin” the pair, you will see that your internal sdcard is empty again.